I've heard of Yacon syrup being a weight loss aid and a sugar substitute. The latter was the main reason I was interested in trying the syrup. My mother is a diabetic. If Yacon syrup could be an adequate substitute for refined sugar, then that would be great. So, I jumped at the chance to receive a free bottle of and review Peak Fusion Organic Raw Yacon Syrup. 100% PURE, RAW, ORGANIC YACON SYRUP - DON'T BE FOOLED!! After extensive third party testing we found many "pure" yacon syrup products only contained an average of 10% yacon root. Our organic, raw syrup contains OVER 12 TIMES the FOS content of many of our competitors based on independent third-party testing. Our Organic Platinum Yacon Syrup is the same clinically-proven, pure, raw, and 100% natural ingredient featured on television and recommended by experts. Our high quality standards help ensure maximum support of healthy weight loss, digestion, and preventing constipation. Studies have shown Yacon Syrup has the ability to decrease abdominal fat and body mass. 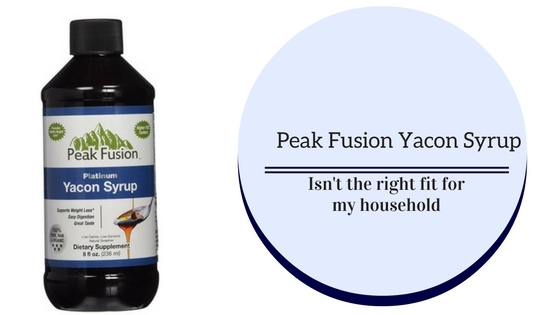 Peak Fusion Platinum Yacon Syrup has a rich, dark, sweet flavor. Easy to pour and sourced from Peru, every batch is third party tested for purity. Pure organic yacon syrup is an excellent alternative to white sugar and honey. Platinum Yacon Syrup is a pure, natural, low-glycemic sugar substitute which adds sweetness and antioxidants with low calories compared to sugar. Recommended as a sugar substitute for diabetics and prediabetics. Can be used by vegans who want a replacement for regular sugar and honey. Full of healthy prebiotic, it easily substitutes for maple sugar or molasses in recipes. Can be used to sweeten your tea, coffee, and other beverages. Easy to use in all recipes. Platinum Yacon Syrup is Organic, Raw, Vegan, Gluten Free, non-GMO with No Fillers, No Binders, and No Artificial Ingredients. Clinically proven ingredient backed by a HASSLE FREE MONEY BACK GUARANTEE. Unfortunately, I could not get pass the taste. My mother couldn't as well. I tried a spoonful of it. It has a molasses tinge to it that did not agree with me. I still tried to use it in other things. I tried it in tea and oatmeal with the same results. I couldn't justify wasting any more of my food on this. To be fair, ever since I became ill last year my flavor profile has shifted. Some things I used to like the taste of and could tolerate, I just can't anymore. This along with the iron supplements I take could be why I couldn't stomach the Yacon syrup. My mother also takes a lot of medication and this could have affected how she perceives the taste of it. It costs $40 (used to be under $20) which is a bit pricey but it sold more as a diet aid which probably accounts for the price. However, if you are a diabetic, why not give it a try? There is a money-back guarantee with it. If it can be an organic, natural sugar substitute to help you with your diabetes then I think trying it is worth it. As with anything that advertises health benefits, consult your doctor before trying it. At least do research from medical websites and actual news articles to get a better understanding of the product. One article that convinced me to try the syrup is from the Wall Street Journal titled Can Yacon Syrup Help Weight Loss. The article gave me a realistic view of the weight-loss claims but it really gave a good endorsement of the syrup as a sugar substitute and the benefits for diabetics. This review was previously published last May on my old Wordpress blog. Now it is on the new site as a Flashback Friday post.